Now that the NHL draft is over with, now comes time for NHL development camps. Below you will find the list of Terriers who are in the camps. The No. 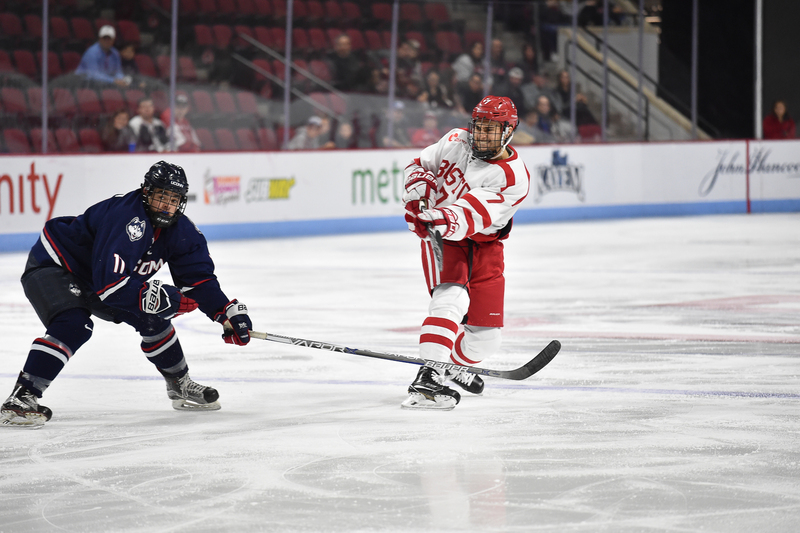 6 Boston University men’s hockey team split its first Hockey East home-and-home series against the University of Connecticut. On both nights, junior forward and assistant captain Bobo Carpenter, who came into the series with no goals, scored for the Terriers first. 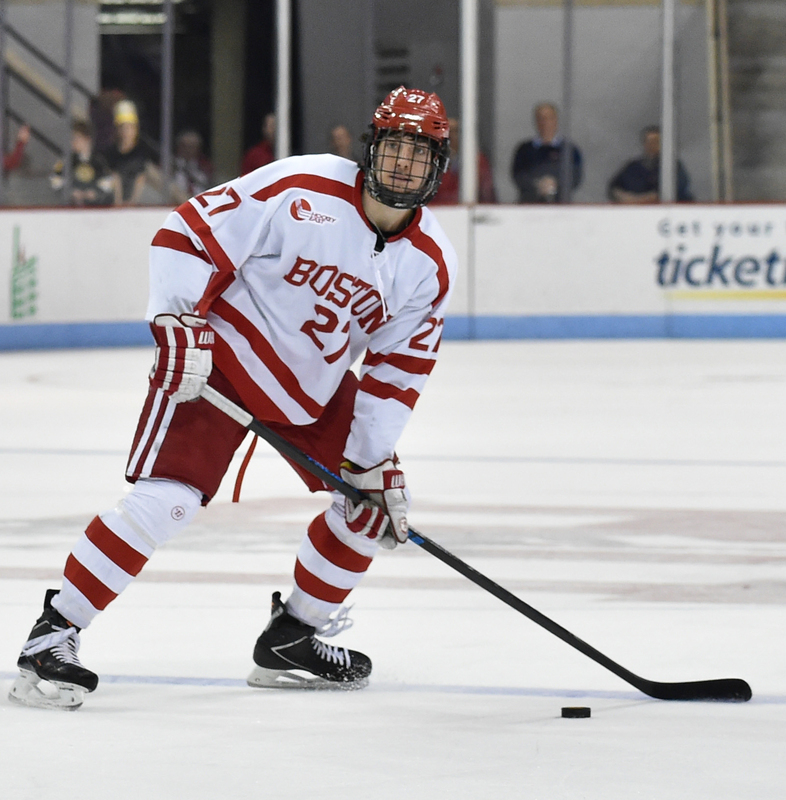 On Friday, Carpenter found the back of the net twice during the second period, both on a pair of BU penalty kills. However, the stellar performance was not enough and UConn’s two power-play goals kept the contest at a 2-2 draw after 65 minutes. On Saturday at the XL Center in Hartford, Carpenter continued his success with a hat-trick while sophomore forward Patrick Curry, and senior defenseman and captain Brandon Hickey each got their first goals of the season. The Terriers’ next matchup will be against the No. 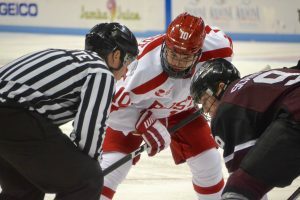 1 University of Denver on Friday night at Agganis Arena and then they will travel to play No. 11 Providence College on Saturday night. If you have any feedback about the Boston Hockey Blog or the live blog, please leave us comments or message us on Twitter/Facebook. We like hearing your thoughts and want to continue to improve our coverage for you all. With the Boston University men’s hockey season right around the corner, this Saturday at 7:30 p.m. to be precise, we have an entire edition of The Daily Free Press full of photos, content and all things regarding BU hockey. Click here for the entire edition, but if you are around BU please pick up a copy today! We are also going to try to put some near the doors of Agganis Arena before BU’s first game of the season against Union College. We dive deep into the No. 2 (in the USCHO.com preseason poll) Terriers as they attempt to make a run to the Frozen Four in Minnesota. Learn all about returning stars and the new freshman that plan on paving the way forBU to make it all the way to this April. The Terriers have a brand new captain this season – senior defenseman Brandon Hickey. Hickey scored four goals while chipping in 11 assists last year while emerging as a prominent force in the locker room. His leadership was rewarded this past spring, as he became the heir to current Columbus Blue Jacket Doyle Somerby on the throne of captainship. Former assistant coach Scott Young moved on to the professional ranks to join BU alum Mike Sullivan’s staff with the Pittsburgh Penguins and the Terriers received someone from the NHL in return. Len Quesnelle, most recently an amateur scout for the Detroit Red Wings, joins David Quinn’s coaching staff for his third assistant coaching job in the collegiate ranks. He plans to be the primary force behind BU’s recruiting efforts. Sophomore goaltender Jake Oettinger was the 26th pick by the Dallas Stars in the first round of the 2017 NHL Entry Draft this summer, but returns to BU with many goals for the upcoming season. One of the best goaltenders in Hockey East, Oettinger will look to be a brick wall in net throughout the year. Although the question remains: what goes on Oettinger’s mind to produce such a calm and stable presence between the pipes? Freshman forwards Brady Tkachuk and Ty Amonte have received the baton from their five-time NHL all-star fathers, both of whom played for BU on the same 1990-91 team during their own college hockey days. Amonte looks to serve a prominent role on the squad’s offensive attack, following in the footsteps of his father Tony, who played in the NHL for 18 seasons with teams such as the Chicago Blackhawks and the New York Rangers. Tkachuk, a forward in his own right and one of the top prospects for the 2018 NHL Entry Draft, will look to light the lamp in the shadow of his father Keith who enjoyed 20 seasons in the NHL. Despite their father’s legacies, the two players hope to create their own at BU. Get to know Max Prawdzik, a redshirt sophomore goalie who spent his spring with the Lone Star Brahmas of the NAHL. Prawdzik discussed what it was like leaving BU for a semester, which he’d bring on a desert island and much more. In Jess Grinberg’s hockey column, Dropping the Gloves, she tackles the heated subject of NHL draft picks and the possibility of the NHL draft age increasing. The issue finishes off with a few must-read women’s hockey stories. “Women’s hockey seniors reflect on their time at BU” – Senior forwards Victoria Bach and Nina Rodgers look to lead a young group of Terriers in their final seasons with the Terriers. “Women’s hockey reloaded, looks to improve on last season” – Find out what goes on behind the scenes when Brian Durocher hits the recruiting trail to add talent to the BU squad. The Boston University men’s hockey team announced its incoming players for the 2017-18 season earlier today. Among the seven incoming forwards and three defenseman that make up the Terriers’ 27-man roster, five members of the freshman class were selected in the 2017 NHL Entry Draft. In addition to the nine-member freshman class, the Terriers have added graduate transfer Drew Melanson who spent his last three years with Rensselaer Polytechnic Institute. Before playing in the NCAA, Melanson played in the USHL for three years and notched 73 points (30g, 43a) over 120 games, according to Elite Prospects. Senior defenseman Brandon Hickey will lead the incoming players and rest of the Terriers this season as captain alongside senior forwards Bobo Carpenter and Nik Olsson, and junior forward Jordan Greenway who will serve as assistant captains. With so much attention falling on BU’s talented forwards, it’s sometimes easy to lose sight of how special the D-corps is. After all, the group allows 2.08 goals per game, tied for the fourth fewest in the nation. The penalty kill enjoys an 87.1 success rate, the NCAA’s fourth best total. And lastly, it has pitched five shutouts through 26 games, more than the last three seasons combined. Perhaps most notably, the starting sextet – senior Doyle Somerby, juniors Brandon Hickey and John MacLeod, sophomore Charlie McAvoy and freshmen Chad Krys and Dante Fabbro – are all drafted by NHL teams. Mindful of all that, Jonathan wrote a longform feature about the contingent and explored what makes the pairings so successful. For a full version of the story, click here. The Terriers secured a statement win over Quinnipiac on Saturday night. The final score was 3-0, with Jordan Greenway, Bobo Carpenter and Jakob Forsbacka Karlsson all scoring. Freshman goalie Jake Oettinger also posted his second straight shutout. Without further ado, here’s what coaches and players had to say in the game’s aftermath. How many NHL draft picks does Boston University have rostered? This past weekend’s NHL Draft in Buffalo, New York was undoubtedly historic for the Boston University men’s hockey team. A whopping six Terriers heard their name called at First Niagara Center, speaking volumes to the youthful talent that will soon grace Agganis Arena for the 2016-17 season. It’s important to take a step back, though, and ponder this: Just how many NHL selections does head coach David Quinn have at his disposal? As it turns out, quite a lot. On any given weekend in Hockey East or out-of-conference play, it’s likely 11 skaters will have been drafted. The numbers break down to five forwards and six defensemen, altogether coalescing into what is – on paper – one of the NCAA’s most talented rosters. Forwards: The Terriers have nearly two lines NHL scouts have tabbed as ready for the next step. It’s impossible to predict who will pan out as hoped, but potential is abound. Defenseman: Lineup decisions and injuries notwithstanding, Quinn could field an entire defensive unit of NHL draft picks. Somerby, the team’s captain, leads the contingent. Here are some remarks from Quinn following the 2016 Draft about the NHL picks that’ll be wearing scarlet and white. Also, be sure to read this article by Alex Prewitt of Sports Illustrated. He was on location in Buffalo last weekend, and has some interesting tidbits from McAvoy, Quinn and Jack Eichel.